Signage is important – it has been the backbone of each starting business in establishing their brand to the public. It has been their face in the market during the times the brand wasn’t well-known, and has been the identity of the company and the employees themselves. Aside from the logo, the font and letter sizing on the signage matters – how can it be read from miles away if the letter size is too small to distinguish? When you decide to print a sign, it’s important to keep in mind the experience and the history of the printing service you plan to hire. As for Signs Australia, they have almost 30 years of experience in printing quality signages and a good service for their clients. While it’s usually overlooked during the process of designing, this is actually one of the important things to consider. It will determine how far your signage can be seen and how your message can be read from miles away. The size also determines the overall quality of the signage and the design. Along with the size (or letter height visibility), colour, placement, and even the lighting, if done right, these contribute to the overall attraction of the people to your store. To understand the letter size you need for your sign, you should consider that your target audience are in motion and a good size will make them easy to read and remember. Remember that for every 10 feet of viewing away from the signage, you have to consider increasing the size of your signage to 1 more inch. 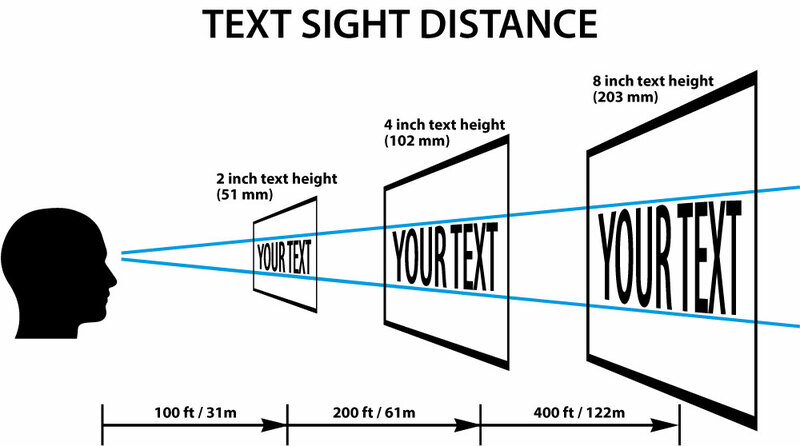 If you want to cover more area – say 130 feet away – your font size should be 13 inches tall to be seen. Colour also plays a big role in the design and the visibility of the letters from far away. The trick is to use the colours that contrasts with the background of the signage. Try to avoid using dark background to avoid being ignored – since most of the target audience you have are either driving, commuting, or walking, it’s important to use light coloured background to make it easier for them to read and remember the message or brand your company has. Aside from the actual sign on the top, there are more signages that you should consider. There are yard signs – they can be mostly be around 5” to at least 7” letter height to be seen while walking. The other would be the sidewalk signs that are plastered on the side of the road for both pedestrians and drivers, so the ideal height would be 6” to 12”. Window display is the best way to communicate to people without actually talking to them, and the ideal height for this to ensure visibility is 8” to 12”. If there is an ongoing event or a temporary signage that needs attention, the ideal height would be 12” to 24” to make sure that people will be attracted to it. A business name sign would be 24” to 48” depending on the signage placement. Traffic signs or directional signages for private sectors and such can be 10” to 14” to ensure visibility.